Jonathan Swift was born in Dublin, Ireland. 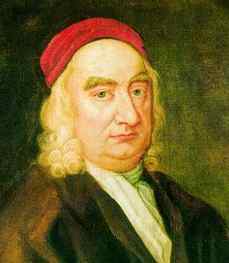 His father, Jonathan Swift Sr., a lawyer and an English civil servant, died seven months before his son was born. Abigail Erick, Swift's mother, was left without private income to support her family. Swift was taken or "stolen" to England by his nurse, and at the age of four he was sent back to Ireland. Swift's mother returned to England, and she left her son to her wealthy brother-in-law, Uncle Godwin. Swift studied at Kilkenny Grammar School (1674-82) and Trinity College in Dublin (1682-89), receiving his B.A. in 1868 and M.A. in 1692. At school Swift was not a very good student, and his teachers noted his headstrong behavior. When the anti-Catholic Revolution of 1688 aroused reaction in Ireland, Swift moved to England to the household of Sir William Temple at Moor Park, Surrey: Lady Temple was a relative of Swift's mother. He worked there as a secretary (1689-95, 1696-99), but did not like his position as a servant in the household. In 1695 he was ordained in the Church of Ireland (Anglican), Dublin. In Moor Park, Swift also was the teacher of a young girl, Esther Johnson. He called her Stella, and when she grew up she become an important person in his life. Stella moved to Ireland to live near him and followed him on his travels to London. Their relationship was a constant source for gossips. According to some speculations, they were married in 1716. Stella died in 1728, and Swift kept a lock of her hair among his papers for the rest of his life. After William Temple's death in 1699, Swift returned to Ireland. He made several trips to London and gained fame with his essays. Throughout the reign of Queen Anne (1702-14), Swift was one of the central characters in the literary and political life of London. From 1695 to 1696 Swift was the vicar of Kilroot, Laracor from 1700, and prebendary of St. Patrick's Cathedral, Dublin (1701). In Kilroot, Swift met Jane Wairing, with whom he had an affair. For Swift's disappointment, she did not consider him a suitable marriage partner. Between the years 1707 and 1709 he was an emissary for the Irish clergy in London. Swift contributed to the 'Bickerstaff Papers' and to the Tattler in 1708-09. He was a co-founder of the Scriblerus Club, which included such member as Pope, Gay, Congreve, and Robert Harley, 1st Earl of Oxford. In 1710 Swift tried to open a political career among Whigs, but changed his party and took over the Tory journal, The Examiner. With the accession of George I, the Tories lost political power. Swift withdrew to Ireland. Esther Vanhomrigh, whom Swift had met in 1708, and whom he had tutored, followed him to Ireland after her mother had died. She was twenty-two years younger than Swift, who nicknamed her Vanessa. In the poem Cadenus and Vanessa (1713), Swift wrote about the affair: "Each girl, when pleased with what is taught, / Will have the teacher in her thought." In 1723 Swift broke off the relationship. Ester had sent a letter to Stella, asking if she was married to him. Esther never recovered form his rejection. Swift's letters to her were published after her death. From 1713 to 1742 Swift was the dean of St. Patrick's Cathedral. It is thought that Swift suffered from Ménière's disease or Alzheimer's disease. Many considered him insane. However, from the beginning of his twentieth year he had suffered from deafness. Swift had predicted his mental decay when he was about fifty and had remarked to the poet Edward Young when they were gazing at the withered crown of a tree: "I shall be like that tree; I shall die from the top." He did die in Dublin on October 19, 1745. Swift left behind a great mass of poetry and prose, chiefly in the form of pamphlets. William Makepeace Thackeray once said of the author: "So great a man he seems to me, that thinking of him is like thinking of an empire falling." Swift's religious writing is little read today. His most famous works include The Battle of the Books (1697), exploring the merits of both the ancients and the moderns in literature. Swift stated that "satire is a sort of glass, wherein beholders do generally discover everybody's face but their own." A Tale of a Tub (1704) was a religious satire. It has, at its core, a simple narrative of a father who has triplets and, upon his death, leaves them each a coat which will grow with them. Although the book was published anonymously, it established Swift's reputation. In Arguments Against Abolishing Christianity (1708), the narrator argues for the preservation of the Christian religion as a social necessity. When an ignorant cobbler (John Partridge) published an almanac of astrological predictions, Swift parodied it in Prediction for the Ensuing Year by Isaac Bickerstaff. He foretold the death of John Partridge on March, 1708. Partridge protested that he was alive but Swift proved in his Vindication that he was dead. Drapier's Letters (1724) was against the monopoly granted by the English government to William Wood that provided the Irish with copper coinage. In A Modest Proposal (1729), the narrator (with grotesque logic) recommends that Irish poverty can solved by the breeding up their infants as food for the rich. When the actor Peter O'Toole read it - for some reason - in the reopening of the Gaiety Theatre in Dublin in 1984, several members from the audience departed. Swift has been labeled as a hater of mankind. "Principally I hate and detest that animal called man; although I heartily love John, Peter, Thomas, and so forth," Swift wrote in a letter to Alexander Pope. However, Swift defended ordinary Irish people against England's economic oppression. He also had a philanthropical side. As a churchman Swift had spent a third of his earnings on charities, and he saved another third each year to found St. Patrick's Hospital for Imbeciles in 1757. The power of fortune is confessed only by the miserable, for the happy impute all their success to prudence or merit. Lemuel Gulliver journeys to Lillput, a place where the people are no more than six inches tall, then to Brobdingnag, a land of giants, then to Laputa, a flying island, and finally to Houyhnhnms, a place of horse-like creatures who rule over the Yahoos.